Did you get the memo? D&D is back. Not only that it seems like it may become more popular than ever. The new core set is selling well, there are shows about it online, and many new releases are coming out. 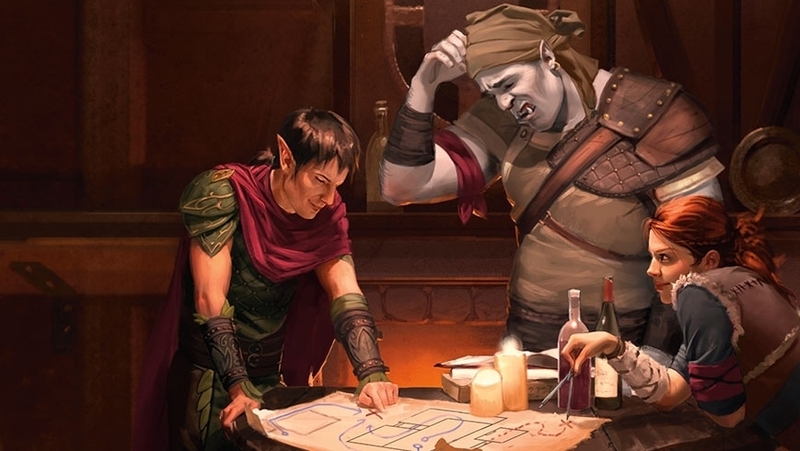 The 5th edition of D&D has managed to bring back old players and make many new players. WOW CHECK OUT THESE DEALS! Noticed today on12/19/2018 there were some insane deals on D&D books on Amazon. Standard cover price is $50 and many are selling at 50% of that and less. Check out the deals now I am not sure how long these will last. I have been seeing D&D articles come out over the past 2 years talking about its sudden resurgence. Most were from geek, board game blogs but recently I have begun to see articles on D&D come out from the Newyorker? The game has also been appearing more and more in popular TV shows. Big Bang theory has devoted a few episodes to playing elaborate Dungeon and Dragons quests. The show Community had a highly popular Dungeons and Dragons episode. Of course the hit show Stranger Things has also grafted Dungeons and Dragons into its first and 2nd seasons. While these appearances sometimes are used to push the idea that their characters are geeks something weird has happened recently. Geeks are cool. Therefore things like comic cons are now...........cool. And it seems Dungeons and Dragons are now cool. I am longtime fan of D&D and throughout the 90s ran a campaign with friends. My friends and I generally kept are gaming a secret like we were doing drugs or something. In the case of D&D it was to avoid all the nerdy labels that seemed to come with it. Its kind of surreal to be at a time where people are asking me, hey have you heard about this D&D thing and how do I get into it? To be honest, though I am a D&D fan I have kind of just stared, slack jawed as people ask me this. My body gets all wobbly and I tilt about debating if have entered some bizarre parallel dimension. As these questions have begun to stack I went ahead and resurrected by D&D group but I quickly ran into a problem,..........Too many people wanted to come over and play. Holy F#%#ing Owlbear Balls! I still have not figured out how to solve that issue currently I have a list! Seriously I have a list of people who want to come to my house eat Papa Murphys pizza, drink micro brews and play D&D. As I have restarted D&D in this new environment I thought I would offer some advice on how start up your own D&D crew. You don't need to take this advice they are just friendly tips. D&D is a game played by adolescent children while there are lots of weird stats and things its not as complicated as you think. Don't be afraid of being Dungeon Master though also don't discount letting someone else taking on that roll as well. The Coreset for 5th edition comes with the directions for 5th Edition, Dice, player sheets and a quest book for the Lost Mine of Phandelver. The whole set provides you everything you need to get going. The Lost Mine of Phandelver is a quest campaign that has a menagrie of fantasy stuff in it and is also jam packed with tips for a new DM or Dungeons Master for you noobs. I hate to tell you to buy things, then post a link to said things. That makes me feel a bit sleezy. Alas I am not lying the Core set can usually be found for 25 dollars or less and has everything you need to get started. If you get a group going and you like it you will then want to start checking out some of the other manuals and things to have a better idea on how to create characters, monsters, spells and quests. The Coreset though really does get you going. There are a few shows online that focus exclusively on D&D or other role playing games. Watching them can give you great ideas on how to play and also inspiration for your own quests. A few of our favorites are Critical Roll that stars voice actor Matthew Mercer as he leads a typically hilarious group through a quest. There is also WASD20 a Dungeons and Dragons fan who walks you though quests. Dungeons and Dragons also have an official channel on Youtube that called DNDWizards that has many celebrities, and other all around D&D experts. You can learn a ton from watching this stuff. There is one more thing you must do! You must find some people to play with. This really used to be the very hard part about D&D. Asking that friend in the cafeteria if he wanted to join your D&D group almost caused as much anxiety as asking a girl out. I have found this has become much easier recently. There are a lot of adults who either want to get back to playing D&D or are curious about playing it. One way to do it is simply to ask your facebook friends if they are interested in forming a group.